This entry was posted in Freemium, Pricing, Streaming, Subscriptions and tagged Ad Supported, Apple, Day Pass, Freemium, MTV Trax, Music Subscriptions, MusicQubed, Netflix, Pandora, Pay As You Go, Pay Per Play, PAYG, Play As You Go, psonar, Spotify, Subscriptions by Mark Mulligan. Bookmark the permalink. Hmm.. I don’t have as much faith in the PAYG model as you do, Mark. One of the benefits of the subscription model is asking the customer to make a decision once and then letting that decision ride…with a PAYG model, you must repeatedly convince a customer to buy your product over and over again. The main problem with the subscription model is it’s pricing. Consumers are anchored at $8 for streaming content with Hulu and Netflix. Consumers also place a higher value on movies and television shows than they do music. So consumers are anchored at $8 for premium, higher value content, and the music industry is coming along and saying the consumer should pay 20% more for music content that has less value to them – content, BTW, that can be streamed on demand via YouTube or as channels via the other services. The pricing really needs to be around $4-$5 a month which is in line with the perceived value and the established price anchoring. Now, will the music biz make money at a 50% reduction in subscriptions? Who knows? But I think that’s where the market is at. Perhaps the training we are alll getting in In-App purchases . . . with premium value tiers . . . is more of a model that might work, with VIP access to additional material. iamschonne – agree on the importance of lowering pricing, which was item number one on my industry pricing ‘to do’ list back in October. And yes, PAYG removes the predictability but there has to be a realistic understanding of the likely spending of lower value consumers. Taking the Netflix example: Netflix stopped reporting churn because so many people were opting in and out of their service. Now few would question the achievements of Netflix but that success is based upon a customer base that does not get locked into a recurring payment for long periods of time. e.g. when they’ve watched all of House of Cards they cancel until there’s something new they want to watch. These are the realities of the empowered digital consumer. You have to meet them on their turf, on their terms. I support the PAYG option. There is a potential market sector of people (myself included) who would like to stream, say, up to 20 albums per month, but wouldn’t want to commit to pay a full £10 (or $10, etc) every month for the opportunity to do so. 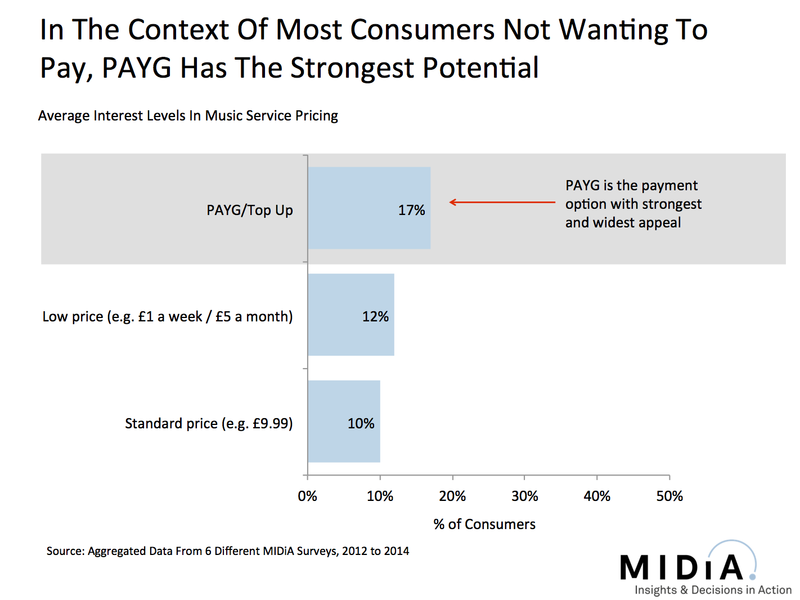 With a PAYG model they might well be prepared to pay more per stream. The mechanics of a PAYG system need to be worked on. I suggest one option would be to require a modest initial minimum deposit, to be drawn down as and when the service is used. For example, the minimum deposit might be $10, which would last longer than a month for a light user. The user might be given the choice of opting into automatic ‘topping up’ to save the nuisance of actively renewing the deposit when it runs out. It would be important to show the user clearly how much they are paying at every stage. Price comparisons with film streaming services are dubious. No film service has anything close to the comprehensive content of the music services. If they did, they would have to charge substantially more than they do now. I am more doubtful about lowering the price of ‘all-you-can-eat’ subscriptions. This would only increase revenue if the increase in subscribers more than offsets the reduction in income per subscriber, i.e. if demand for paid music streaming services is price-elastic. I don’t see any reason to think that it is. Regardless of the mechanics of the pricing system, it will be ineffective unless the freemium services give users more incentives to switch from ‘free’. Simply saying ‘you can avoid the ads by paying’ is not sufficient, because there are not that many ads anyway. Date – a Friday Pass. If there is a perceived difference between the value of music and film ( and clearly there is and perception, after all, is reality!) then the trick will be to tap into how music consumers act differently to movie-goers. Follow that behaviour and monetise it. Make people feel they are getting value and what they want WHEN they want it. David — you mention the mechanics of the PAYG model. That’s exactly what we’re doing at RepX (a streaming marketplace – that’s right, free market, no fixed prices). But we had to get creative in designing the payments so that they’re clear but non-disruptive. The low prices help as well; we don’t really think about purchases as low as a few pennies, we just purchase if we want it. We predict that most streams will be priced around 1-4 cents. And we’re also doubtful about lowering the prices of unlimited streaming subscriptions, like on Spotify. The business model they use is bad and adjusting the price isn’t the solution, switching models is. For instance, the paid subs are used to subsidize all plays, from all (free and paid) users. So if I pay $9.99 in order to listen to one small, niche indie artist on Spotify, that artist may get only a few quarters from me and the rest of my payment goes to the mainstream artists. Direct subscriptions are a better solution, I think. Rather than Spotifys all-or-nothing model, we like direct to artist subscriptions – so rather than a lump payment to the service, you subscribe directly to the artists you actually listen to the most. Again, prices and subscription packages are chosen by the artists. And, of course, you’re right about that “something extra” necessary to draw people over from free to paid. As sites like Bandcamp and Patreon have demonstrated nicely, that extra is all about the artists, experiences, and interactions. We’re just starting to give private demos; we’ll be opening RepX to the public soon though. Feel free to contact us if you want to see your ideas in action; we’d be delighted to talk and get your feedback.